A Bangladeshi woman’s marriage aspirations and excitement fades away faster than the mehndi in her hands. Not for all, but definitely for most! The reason is loud and clear: Our Patriarchal Society! Almost half of all women who are married or have been married in Bangladesh, experience physical and/or sexual violence during their lives, with 1 in 4 experiencing it within the first 12 months of marriage. According to the Bangladesh Bureau of Statistics (2015), about 76% of female students face some sort of sexual violence during their higher education. Only 2.6% of these women report these incidents of sexual abuse. “There’s the systematic dawdling in handling such cases that discourages many women from reporting,” says Rokeya*, 35, who herself is a survivor of sexual violence. Rokeya visited the “Solution Fair,” a first-of-its-kind event in Bangladesh organized by the United Nations Population Fund (UNFPA) in collaboration with the Government of Bangladesh and other partners as part of the global 16 Days of Activism Campaign to end violence against women and girls. The Solution Fair was designed for participants like Rokeya who lack access to information about the responses undertaken by the government, different agencies of the United Nations, and international and national NGOs. “Before coming here, I really didn’t know that there are dedicated support desks in police stations for victims of gender-based violence,” she added, referring to the Women’s Help Desk program, a joint initiative of the Bangladesh Police and UNFPA under which 24 dedicated help desks operate in different districts with a view to increasing reporting of GBV and improving the services available to women who report. The Solution Fair engaged stakeholders who displayed their own responses to end violence against women and girls in Bangladesh along with the reintegrating mechanisms that have been established by different parties to support survivors. Throughout her visit to the Solution Fair, the chief guest and inaugurator of the fair, Meher Afroz Chumki, Hon State Minister of the Ministry of Women and Children Affairs, was accompanied by the Dr. Asa Torkelsson, UNFPA Bangladesh Representative. Dr. Torkelsson guided the honourable minister and introduced her to all stakeholders during their visit to each stall. 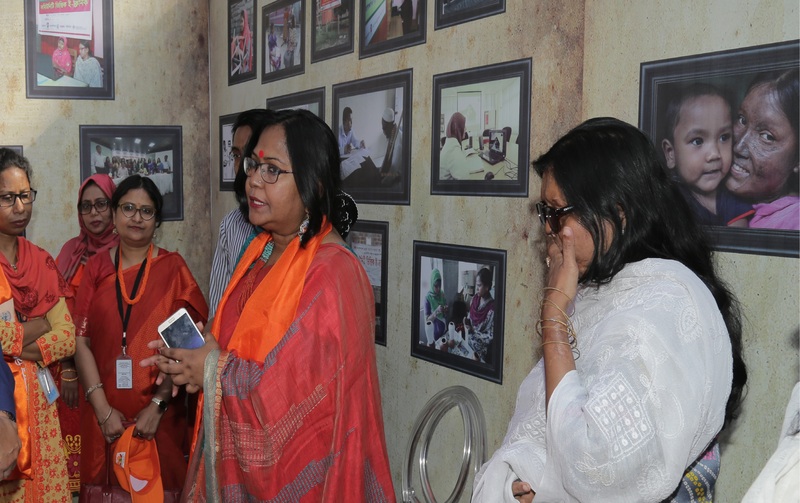 At one point in her visit to the fair, Meher Afroz Chumki, the Minister, came across the stall of the Generation Breakthrough project, UNFPA’s flagship project on adolescents and youth supported by the Embassy of the Kingdom of the Netherlands. The project equips young people with life skills and knowledge using innovative approaches. After eagerly interacting with some of the participant youngsters, the Minister was impressed to see how these youngsters are being sensitized at an early age through edutainment, to positively shift attitudes and behaviours around gender roles, gender-based violence, and sexual and reproductive health. Among other dignitaries who graced the occasion, Additional Inspector General of Bangladesh Police, Md. Mokhlesur Rahman, who has recently been selected as one of the global champions of UNFPA for his contribution to preventing violence against women, was also impressed by the organization's integrity and efforts to free Bangladesh of gender-based violence. Among the other partners, the stall of the Multi-sectoral Project on Violence against Women, administered by the Ministry of Women and Children Affairs, garnered a lot of applauds from the visitors. The comprehensive initiative provides an array of services under an umbrella. “It’s really good to know that one helpline provides all the comprehensive services in regard to GBV,” said Sharmin*, a visitor and activist, adding that the initiatives undertaken by the government over the last years is really commendable and should act as inspiration to other stakeholders who dreams of Bangladesh free of all forms of violence against women and girls. ActionAid Bangladesh, on the other hands, stall attracted people due to their live action, self-defence performances. In combating violence against women, ActionAid Bangladesh takes a 360-degree approach. They take an integrated approach of self-defence through Krav Maga, the no.1 self-defence practice in the world. “At first, the girls are taught about “avoidance” so that they learn to identify danger. Secondly, they are taught to “diffuse” where they learn to escape a hazardous situation through psychological manipulation,” Tomal Saifullah, instructor, explained to the visitors. “This is empowering in its truest sense because now I know how to protect myself when there’s no one around to do so,” said Samiya*. The 16-year-old has been trained by ActionAid Bangladesh and recommended that every girl, especially in this country, should learn how to protect themselves from perpetrators. Another widespread form of gender-based violence in Bangladesh is acid attacks. “We follow a bio-psycho-social model in order to provide an integrated approach to rehabilitation, legal-educational-communal preparation, and social acceptance,” said Salina Ahmed, Executive Direction of Acid Survivors Foundation. The organization is currently working on an ICT based solution (i.e. app) linked with different source providers and several market-based, school and college-based campaigns to combat gender-based violence. With the theme “Orange the World: #HearMeToo”, the Solution Fair was held following the inauguration of the 16 Days of Activism Campaign in Bangladesh at Dhaka’s CIRDAP premises. More than 300 guests including government and UN dignitaries, ambassadors, noted personalities and activists visited the fair, including Nasima Begum ndc, Hon Secretary of the Ministry of Women and Children Affairs, and Mia Seppo, UN Resident Coordinator in Bangladesh, who were present as the special guests at the occasion. There were a total of 14 stalls in the fair: Acid Survivors Foundation (ASF), Action Aid Bangladesh, Bangladesh Legal Aid And Services Trust (BLAST), Center for Men and Masculinities Studies (CMMS), Food and Agriculture Organization of the United Nations (FAO), International Labour Organization (ILO), Joyeeta, Multi-sectoral Project on Violence Against Women, United Nations Populations Fund (UNFPA), UN Women, Unite for Body Rights Alliance, Nirapod, AdoHearts, and other partners of the Kingdom of Netherlands. Initiated in 1991, the 16 Days of Activism Against Gender-Based Violence is a worldwide campaign to combat violence against women and girls. Celebrated from 25th November to 10th December, the campaign runs in between the International Day for the Elimination of Violence against Women and Human Rights Day. The United Nations Population Fund (UNFPA) has been working on maternal health, comprehensive sexual and reproductive health, population, planning and research and prevention of gender-based violence for the longest time, but this year for the first time ever along with the Government of Bangladesh they organized a “Solution Fair” as a part of the 16 Days of Activism Campaign. This year with the theme “Orange the World: #HearMeToo”, various dignitaries, noted personalities, prominent organizations and visitors were invited to provide a wider outlook on gender-based violence. These notables showed up dressed in orange along with possible solutions (preventive and curative) to diminish gender-based violence, most notably, early marriage. They initiated with discussing the origins and types of violence. Almost all of them argued that violence and abuse are not just physical but also, economical, mental and social. It’s important to come up with better, more effective measures for the police and activists to receive notifications as soon as any form of gender-based violence occurs. Nurturing girls differently and instilling a positive outlook for women in men are some of the best precautionary measures according to them. Not only are people unaware of the different types of violence but are also unaware about where to go and who to consult when it does occur. The statistics are pandemic in Bangladesh. About 76% of students face sexual violence during their higher education and only as low as 2.6 % of women actually report sexual abuse. Not only is the reporting slow but sadly, the conviction is also low. In order to challenge patriarchy, gender inequality, impure mindsets and other forms of gender-based violence, prominent organizations discussed their possible solutions at the fair. There were a total of 14 stalls including Acid Survivors Foundation (ASF), Action Aid Bangladesh, Bangladesh Legal Aid And Services Trust (BLAST), Center for Men and Masculinities Studies (CMMS), Food and Agriculture Organization of the United Nations (FAO), International Labour Organization (ILO), Joyeeta, Multi-sectoral Project on Violence Against Women, United Nations Populations Fund (UNFPA), UN Women, Unite for Body Rights Alliance, Nirapod, AdoHearts, and other partners of the Kingdom of Netherlands. The Food and Agriculture Organization of the United Nations (FAO) stated that through different methods as such as the agriculture investment program, they are working collectively to empower women. They are instilling necessary skills like crop cultivation, using alternative fuel sources, and better hygiene practices and so on. FAO hopes that this kind of capacity building will continue making women more financially independent while facilitating better decision-making skills in them. The Acid Survivors Foundation, since day one, are consistently working to ensure that acid violence survivors lead a life of dignity and normality. They follow a bio-psycho-social model in order to provide an integrated approach to rehabilitation, legal-educational-communal preparation, and social acceptance. ASF is presently working on an ICT based solution (i.e. app) linked with different source providers and several market-based, school and college-based campaigns to combat gender-based violence. The Unite for Body Rights (UBR) programme is supported by the Kingdom of the Netherlands. They create access to SRHR information through in and out of school education, raise awareness amongst community stakeholders and advocate for the recognition of adolescent and young people rights as citizens, along with their sexuality and reproductive health. The UBR contains 4 pillars: Comprehensive Sexuality Education (CSE), Youth Friendly Service (YFS), Enabling Environment (EE) and Advocacy. The United Nations Entity for Gender Equality and the Empowerment of Women (UN Women) have plans to publicize the adversities and offences of gender-based violence. They plan to take it to the masses. According to them, proper counselling, plausible documents, and publications of the rights of female students and women plus maintaining a healthy relationship between law enforcing agencies and educational institutions in order to create awareness are some of the most important solutions. Action Aid Bangladesh, on the other hand, takes a 360-degree approach to the matter. They take an integrated approach of self-defence through Krav Maga, which happens to be the no.1 self-defence system in the world. At first, the girls are taught about “avoidance” so that they learn to identify danger. Secondly, they are taught to “diffuse” where they learn to escape a hazardous situation through psychological manipulation. Fighting back is only encouraged when they are unable to escape. Last but not least, their training methodology spurs rightful aggression in girls. Unlike their conventional nurturing, girls here are taught to fight back and stand up for themselves as opposed to being shy and submissive at all times. It is imperative to engage men and boys to advance gender equality and end violence against women. With this view, Center for Men and Masculinity Studies (CMMS) has been working to sensitize adolescents about GBV, while strengthening their knowledge on Sexual and Reproductive Health Rights (SRHR). Keeping the difficulties of getting comprehensive knowledge about adolescent health in the social context of Bangladesh, CMMS developed an interactive app named “Challenger Mamu”. The app provides adolescent boys and girls with comprehensive SRHR knowledge and services in a simple yet effective context. The app also serves as an open forum for the adolescents, where they can ask questions about their sexual and reproductive health and get instant answers from experts. Multi-sectoral Project on Violence against Women, administered by the Ministry of Women and Children Affairs, provides an array of services under an umbrella. The services include a national toll-free helpline to report violence against women and girls, a mobile app named “Joy” that helps women and girls to report probable cases of violence and connects them with the nearest Thana to take immediate measures. Under the project, the government also established a total of 67 One Stop Crisis Cells, a National Forensic DNA Profiling Lab, 6 Divisional DNA Screening Laboratory, a National Trauma Counselling Center, several Regional Trauma Counselling Centers, among others, all dedicated to providing essential services to GBV survivors around the country. To combat violence against women and girls, the United Nations Population Fund’s (UNFPA) in collaboration with Bangladesh Police established a number of Women Help Desks (WHD) in different police stations around the country to address cases of GBV. To give the silenced survivors of GBV a voice and a space to talk and get enlightened, UNFPA also established Women Friendly Spaces (WFS), a safe haven for women to share their pain, trauma, or any kind of needs. Apart from serving as a safe space, the WFS also provide an array of essential services and training to women including, psycho-social counselling, midwifery services, and skills training. The Generation Breakthrough project, a flagship project on adolescents and youth facilitated by UNFPA and supported by the Embassy of the Kingdom of the Netherlands, equips young people with life skills and knowledge using innovative approaches to positively shift attitudes and behaviours around gender roles, gender-based violence, and sexual and reproductive health. The International Labour Organization (ILO) is advocating for maternity benefits and gender-responsive factory design in Bangladesh in order to secure the maternity protection and benefits for women working at garment factories. Aside from their continued advocacy for stronger sexual harassment prevention laws, the organization also provides hard and soft skills training for career development of women workers in the country, who constitute only 5% of the total supervisory posts in garments, while 61% of all garment workers in Bangladesh are women. Owing to the limited access to the formal and/or the informal justice system, women and girls, particularly, become more vulnerable as they have minimal avenues to voice their problems and seek redress. Bangladesh Legal Aids and Services Trust (BLAST) works to give these often unheard women and girl victims a voice and seeks to raise their awareness and understanding of available rights, remedies, and services, in order to ensure greater responsiveness to their needs from within the justice system. BLAST’s core activities focus on legal aid (advice, referral, mediation, litigation and community awareness) for the poor and marginalized with a special focus on GBV victims. The organization also advocates addressing discriminatory and arbitrary laws, while undertaking capacity building and training for key actors in the justice system. To accelerate the process of building gender equality based society through empowering women economically, the Ministry of Women and Children Affairs launched Joyeeta, a dedicated marketing platform in Dhaka to market products and services produced, processed and value added by underprivileged women. Adopting a preferential treatment approach towards women, Joyeeta seeks to build a dedicated women-friendly marketing network around the country exclusively for women entrepreneurs. The organization also helps to develop entrepreneurial capacity among women through skill training. The knowledge booth in the fair was comprised of printed materials including study papers, publications, reports and so forth on GBV related issues by the participating agencies. Set up with a view to deepen the understanding of the visitors regarding GBV issues in Bangladesh. 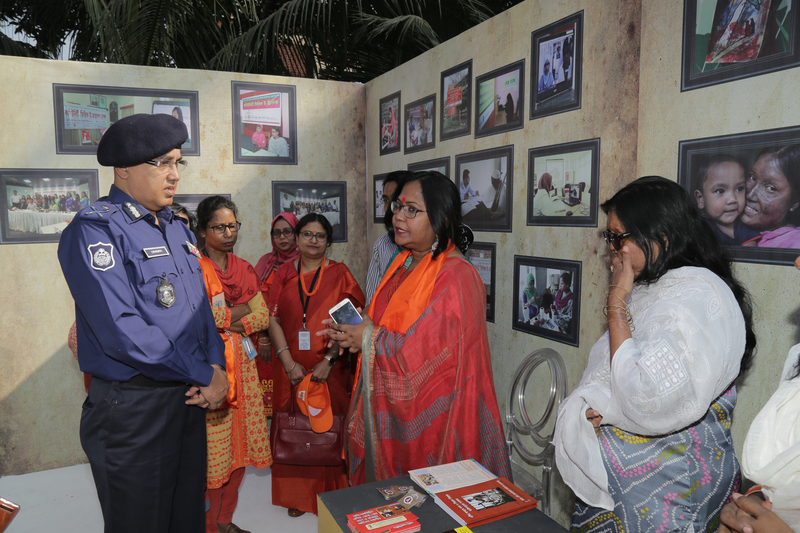 The booth also provided them with an opportunity to share knowledge and engage with the works that the participating organizations are carrying out to end violence against women in Bangladesh.